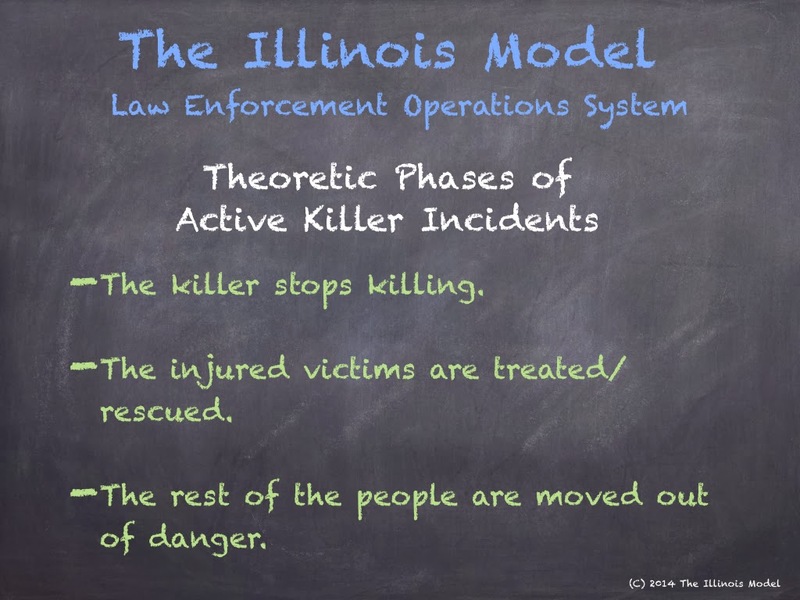 Active Killer Response: Is Yours Simple Enough? While stemming from the best of intentions, American police policy and training for active killer incidents has grown to be too complicated and unworkable. The three main life-saving functions of police officers in those first minutes are being lost in binder-thick crisis plans and checklists of non-vital issues. killer(s), who may still be actively killing. injured victims, which may include dead ones. other people in the danger area. Not traffic gridlock. Not locked doors. Not missing whiteboard markers. Not congested radio communication. Not plainclothes cops. Not frantic parents. Not threats of explosives. Not "one-size-doesn't-fit-all" ballistic helmets. Not malfunctioning closed-circuit camera feeds. Not horrible weather. Not hoards of news media trucks. Not misplaced triage tarps. Not out-of-date telephone lists. Not confusing building layouts. Yes, those things affect the actions of officers and medics. But they are not the main concerns. Yes, those issues complicate the response....maybe a lot. They may bog down officers. They may slow or delay the response. They arguably mess with efficiency of response. And yes, there is a difference. And yes, I understand causality. But they cannot become the main concerns in and of themselves. Not in planning. Not in debriefing. Not ever. ONE: The killer must stop killing. Suicide? Run out of ammo? Arrested? Surrender? Killed by police? Subdued by citizens? Leaves the scene? Figure it out. Make sure it happens. TWO: The injured victims must be treated. Triaged? Collected in main area? Bring paramedics inside danger area? Treated on site? Dragged? Bandaged or tourniqueted by cops? Treated by tactical medics? Given self-aid "toss bags?" Told to run to an ambulance? Escorted to squad cars? Figure it out. Make sure it happens. THREE: The rest of the people must be moved out of danger. Told to run out themselves? Given directions to evacuation point? Sheltered-in-place until later? Escorted by SWAT team? Figure it out. Most, if not ALL, every active killer/ mass-casualty events have these three functions. And because they are ranked in order or importance...they become pseudo "phases" of initial response. That's not to say that some of these functions cannot be done simultaneously. For example, cops making an entry into an office building while running towards the gunfire can tell people to get out of the building and run away. This accomplishes some of the evacuation while working towards stopping the still-active killer. However, I caution against putting any considerable effort into medical treatment (by armed police officers) while an armed attacker is still causing carnage! These phases can be interpreted as Missions-Objectives in our Model. These are NOT distinct phases. If, while treating victims, there is more active offender gunfire, the rescue efforts may have to be paused while turning efforts to stop the killer from killing. If, while evacuating hiding persons, there is a room full of injured victims, the evacuation is stopped to handle the treatment/rescue. Keep in mind this is response theory; not steps in a checklist. Because of the differences in the objectives of these three theoretic phases, it is important that all responders understand the current problem, the current mission, and the current strategy. 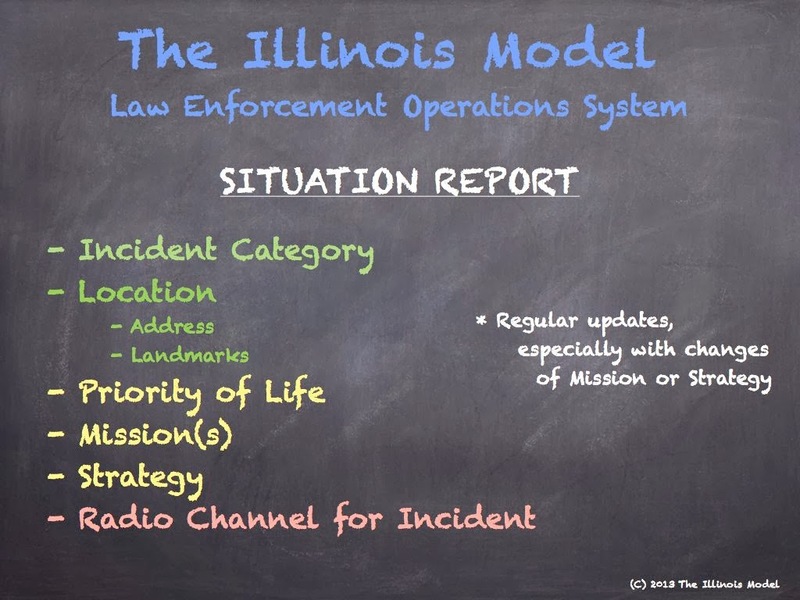 This is where the Incident Command aspect comes in....specifically the concept of the Situation Report (or SitRep). Give responders a goal! Be sure they understand the CURRENT mission. Because this is a police emergency first and foremost (sorry medics), responding police officers have to understand what their current mission is. Are they in "stop an active gunman/killer" mode? or are they in "rescue the injured" mode? or are they in a "search/evac the building" mode? THEN....at what speed or strategy? What does this sound like on the radio? We have active shooter incident at City Hospital; Main Street at the river; shooter is down; multiple victims; I need cops and medics inside now to rescue and treat the wounded. Simple and to the point. Any responder should understand that this is a rescue mission at this point. Without this vital information, all else is moot. Anything in addition to this is a bonus. Leave it to the responders to adapt to the problems. Let them figure out how to get inside. How to treat. How to carry. How to recover. How to transport. What's important is that they understand this is the time to attend to injured victims....not looking for a gunman. Not evacuating scared people. And this matters. A lot. Unified mission. Unified strategy. Radio. Communicate goals and plans. Breaching equipment. Get inside the danger area. These tools are more important than my ballistic helmet, whiteboards, building layout blueprints, and even keys to the buildings. These tools are highly adaptable. They work in a myriad of situations. They are Generalized....as compared to Specialized. When paired up with a brain programmed to adapt in a dynamic and changing environment, these tools work. Just as the equipment is universal and useful in a wide spectrum of situations, so are the strategies and tactics. Police response plans have to be generalized enough to be effective at: sports stadiums, parks, hospitals, nursing homes, daycare, grocery stores, factories, churches, college dorms. Specialized and detailed plans DO NOT WORK in crisis. It's a fallacy propagated by bureaucrats without any operational experience or scientific understanding of how the human brain functions. And cops and paramedics brains function exactly like everyone else's! That's truly it. There are no secret plans. Sure we work on some tactical stuff. But that too is flexible and rooted in principle. Yes, we do scenarios. But the real work is done by understanding the impact of identifying the problem, the mission, and the strategy. Please do not fall for the complicated plans and response protocols. There are too many bureaucrats pushing that agenda. Active killer response....or for that matter....ANY public safety incident response.... is not as complicated as many make it out to be. 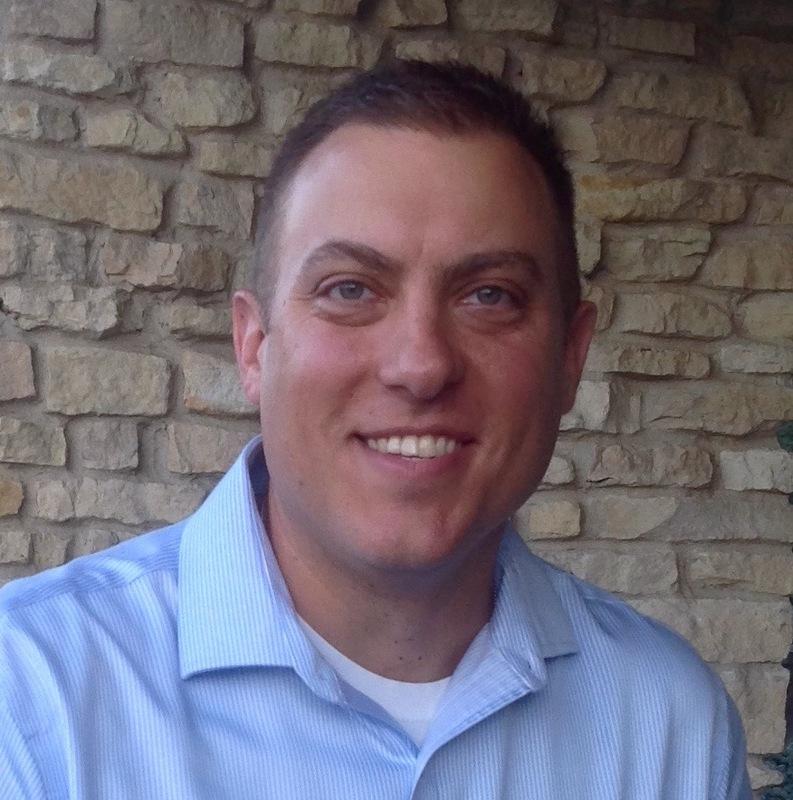 Lou Hayes, Jr. is a Police Sergeant and training coordinator for a municipal Chicagoland police department. He is also assigned to the department's Crisis Intervention Team (CIT) and formerly a multi-agency SWAT unit (17 years). Lou holds a "Master Tactical Patrol Officer" certification through the Illinois Tactical Officers Association, with instructor responsibilities in Rapid Deployment and MACTAC active killer response programs. Great article-succinct and to the point!